The Cleveland Indians’ pitching staff for the 1957 season reads like a Who’s Who: Early Wynn, Mike Garcia, Don Mossi, Bob Lemon, Ray Narleski, Cal McLish and Herb Score. 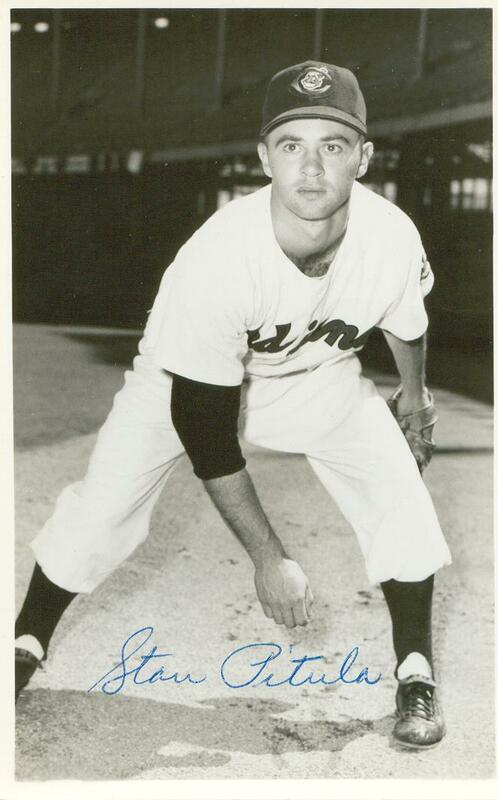 Then there was Stan Pitula, one of the Indians’ top pitching prospects, who spent the 1957 season with Cleveland. He made 5 starts and 18 relief appearances, posting a 2-2 record. On July 24, 1957, the 5’ 10”, 170-pound righthander threw out his elbow while pitching to Roy Sievers in the fourth inning of the first game of a doubleheader in Griffith Stadium. He never threw another pitch in the major leagues. Life is often short and uncompromising. It can encompass both success and tragedy. A gritty pitcher with a fun-loving personality becomes a high school baseball star, signs a professional baseball contract and steadily rises through the minor leagues to reach the major leagues, marries and has two children, then is felled by a career-altering injury in his first season in the big leagues. He attempts comeback after comeback only to fail to reach his goal of a return to the majors. He works as a machinist in a South Hackensack factory and separates from his wife. He commits suicide at the age of 34. Stanley Pitula Jr. was born March 23, 1931, in Hackensack, New Jersey. He was the son of Stanley Pitula and his wife Mary. Stanley had immigrated to the United States in 1912 at the age of 16, having been born in Galasia, Austria, of Ukrainian descent. He was wed to Mary Warchalowski on October 6, 1918. Stanley and Mary had six children, 2 boys and 4 girls, Stan being the fifth child. Stan’s father worked as a laborer in the chemical industry according to the 1920 Census. Subsequently he was employed by the Bergen County, New Jersey, Road Department. Stanley and Mary were lifelong residents of Hackensack. Mary passed away in 1955 while Stan’s father passed away in 1993. He was named to the All-Bergen County baseball team. He was joined by 3 players from the neighboring town of Lodi, New Jersey – Joe Cunningham, Art Remsa and Frank Olasin – on the first team. Cunningham went on to a successful 12-year career as a major leaguer with the St. Louis Cardinals, the Chicago White Sox and Washington Senators. Remsa played 6 years and Olasin 4 years in the minor leagues. One of Stan’s Hackensack baseball teammates that year was Chet Hanulak, who went on to star in football at the University of Maryland and later for the Cleveland Browns. In 2000, Stan was named to the Bergen County all-decade team of the 1940s along with future major leaguers Tom Acker, Sammy Calderone, Sam Dente, Larry Doby, Gus Keriazakos, Ray Narleski, Eddie Miksis and Barney Schultz. It is apparent that Bergen County New Jersey produced some pretty fair baseball players. Stan’s aspirations were set forth in the 1949 Hackensack High School yearbook which stated: “Stan is a sports enthusiast whose aim in life is to become a professional baseball player…we wouldn’t be surprised to find him someday in the Baseball Hall of Fame.”  Stan achieved his goal of becoming a professional baseball player by making the major leagues, but due to injury we will never know how good he could have become. Stan was signed to a minor league contract with the Cleveland Indians for the 1950 season by Cleveland Indians scout Hal Reason and spent five years in the minor leagues and two years in the Army before making the parent club. The following is a summary of his minor league achievements. * In 1950, he went 17-12, ERA 4.00, with Daytona Beach of the Florida State League. * In 1951, he went 15-11, ERA 3.43, with Spartanburg of the Tri-State League. * In 1954, he went 20-9, ERA 3.16, with Keokuk of the Three-I League. He was named to the Three-I League All-Star Team along with teammates (and future major leaguers) Roger Maris and Dan Osinski. Stan led the Class B Three-I League in Innings Pitched (245), wins and strikeouts with 172. He is the only 20-game winner in Keokuk baseball history and was described by the Keokuk Daily Gate City as a favorite with the fans. He was added to the Cleveland Indians roster for 1955. * In The Sporting News of November 28, 1956, it was noted that Pitula, “a gritty righthander who came fast at Indianapolis last season, has been tabbed as the reliever to replace [Ray] Narleski if the latter commands satisfactory exchange value on the trading mart.” In a January 2, 1957, The Sporting News article, Kerby Farrell, Cleveland Manager, predicted that Stan was the sleeper of all the Cleveland rookies and that he will be a big help to the Indians as a reliever. Stan was a confident pitcher as he started spring training in 1957 with Cleveland. In a wire photo dated April 5, 1957, one can clearly see the back of Stan’s glove. It should be labeled “S Pitula”; actually it is labeled “S P1tula” - the # 1 replacing the “I” in Pitula. This act strikes one as a pitcher confident in his abilities. Pitula made five starts for the 1957 Cleveland team, all within a one-month period. His first major league start was Saturday, June 29, against the Baltimore Orioles at Memorial Stadium in the first game of a doubleheader. Cleveland beat Baltimore 2-1 with Pitula the winning pitcher. His second start was Friday, July 5, against the White Sox at Comisky Park. Cleveland lost to the Sox 14-4, Pitula taking the loss. Start number 4 was Thursday, July 18, at Cleveland Stadium against the Washington Senators. Washington, behind Camilo Pascual, shut out the Indians 4-0. In this game, Gene Woodling of the Indians threw out two Washington baserunners from left field in the first inning, tying a major league record. Pitula’s final major league appearance was September 14, 1957, not as a pitcher but as a pinch runner in the second inning for Cal McLish in a game the Indians lost 13-10 in Fenway Park. Pitula went 2-2 with an ERA of 4.98 with Cleveland in 1957. In three of his five starts he went at least 6 2/3 innings (the final start he left due to injury) and never allowed more than 3 earned runs in a start. Barring the injury, he had probably pitched well enough to stay in the Indian pitching rotation. It has been disclosed in PARAMUS N.J. today that the Indians have signed a bonus baby. The prize rookie’s name is LISA JEAN PITULA who is 18 ½ inches tall and weighs 6 pounds. The signing took place in VALLEY HOSPITAL and was accomplished thru the joint efforts of STAN and NORMA PITULA. Even with the injury, Stan’s fun-loving personality continued unabated. In a March 5, 1958, news item in The Sporting News, it was noted that teammate Rocky Colavito had discarded his number 38 and now was wearing number 6. Quipped Stan “You’re getting closer to DiMaggio” (who wore number 5). After the injury, Stan was sent to Mobile of the Southern Association. He then spent the next 4 years in the comeback mode as he traveled throughout the minors and the winter leagues. * Stan went 0-1 with San Diego of the Pacific Coast League in 1959. In June 1959, San Diego sold Stan to Denver of the American Association. On June 27, 1959, Stan belted a 2-run homer in a 7-5 win over Indianapolis. On July 5 in the first game of a doubleheader, Stan allowed only 2 hits in a 1-0 shutout over Omaha. He walked none and was behind on the count to only one batter. But he continued to get hammered in subsequent games. On August 26, 1959, he was found to have torn rib cartilage. His 1959 record with Denver was 6-7, ERA 4.87. * In 1960, he was 0-2 with Chattanooga of the Southern Association. On December 15, 1960, Stan wrote a letter to Ralph Kiner, general manager of the San Diego Padres of the Pacific Coast League. Stan stated that he was negotiating with four other clubs besides the Padres and therefore would like an answer from the Padres. Stan requested a salary of $1,000 per month plus 20 percent of any sale price if he was sold to a major league club. In the concluding paragraph of the letter, Stan noted that there were two new teams in the league (presumably he meant the Angels and the new Senators) which boded well for his prospects and that he was counting on playing at least ten more years. He noted that he also felt the only way to raise his salary to a decent level was to request a percentage of the sale price to a major league club. Reading this letter with the knowledge of Stan’s career from 1957-1960, one can sense the desperation to salvage his playing career, knowing that in all likelihood he cannot. * In 1961, he was 0-0 with Buffalo-Jersey City of the International League. In 1972 former major league pitcher Jim Bouton was the recipient of the first “Stan Pitula award for pitching.” No record has been found of later winners, nor could it be established who presented the award. Mr. Bouton was contacted regarding the award but had no recollection of it. Little is known of the elbow injury that curtailed Stan’s career. There is no record of any surgery being performed. It appears through The Sporting News says Stan simply tried to pitch his way through the injury. It is almost certain that if an injury of this type occurred today, surgery would have given him a good chance of continuing his baseball career. Stan was a workhorse throughout his career. He pitched a large number of innings each year, followed by appearances in winter ball. Although there is no proof that overwork was the cause of the injury, there is little doubt that teams of today would not allow the high annual total of innings pitched by a top prospect like Stan. Speculation arose that Stan threw his arm out while striking out Yogi Berra. This was mentioned by a member of his family. As previously noted, his injury was documented as occurring in July 1957 while pitching to Roy Sievers of the Senators, and the re-injury which occurred in the spring of 1958 was in a Cleveland intrasquad game. However, the Yogi Berra story was documented in a newspaper article written shortly after Stan’s death. Bobby Potts, the manager of the Paterson Phillies was quoted: “It was a chilly night at Yankee Stadium and Stan was called on to relieve with the bases loaded. Yogi Berra worked him to a full count, but Stan got him with a beautiful screwball. ‘That was the first time I used that pitch,’ he [Stan] told me later, but something snapped in my elbow, he said.” According to Retrosheet, this incident occurred on May 19, 1957, although Stan did not relieve with the bases loaded but walked Mickey Mantle to load the bases before striking out Berra. If this is the case, no mention of any injury was mentioned in the press until the July injury in Griffith Stadium. There is no reason to doubt Potts’ story since it came from a long time acquaintance with Stan and Stan would have wanted to keep the injury secret as he was just starting to get some innings with the Indians at the time. In that case the Sievers’ situation was the breaking point where he could no longer pitch through the pain. My primary avocation is the history of Keokuk, Iowa, baseball. Stan Pitula is the only 20-game winner in the long history of Keokuk baseball. This ultimately led to my interest in Stan’s career and this biography. The primary source for this project was The Sporting News. I reviewed the searchable database for all Stan Pitula items from the inception of his career until his death in 1965. The source of family information was the 1920 U.S. Census and correspondence with Maureen Baldassini, Stan’s cousin, who was the primary spokesperson for the family as Maureen discussed Stan’s life and career with his siblings and communicated their information to me. Additional family information as well as several newspaper articles accumulated at the time of Stan’s death were provided by Stan’s niece, Susan Arnold. The Keokuk Daily Gate City archives were reviewed for Stan’s 1954 season in Keokuk. There is some confusion over the proper name. Stan’s middle name was Alexander and he was not Stanley Jr., according to an interview with one family member. However all documents that Stan personally prepared or signed indicates that he was Stanley Pitula Jr. This includes his handwritten documents from The Sporting News. In addition, the gravestone is engraved Stanley Pitula Jr. According to Susan Arnold, Stan’s niece, his family nickname was “Sonny” and he was known by her and other family members as “Uncle Sonny” in later years. The nickname apparently did not leave the family as he was never referred to as “Sonny” professionally although the name did appear in the 1957 TSN Baseball Register. One of Susan’s memories of “Uncle Sonny” was the card tricks he was always showing the family. This fits in with the playful personality that many family, friends and professional acquaintances recalled about Stan. Undated and unsourced newspaper article written shortly after Stan’s death provided by Susan Arnold. High School statistics and high school yearbook information were provided by Hackensack High School Baseball Coach Rich Mauriello. 1949 Hackensack High School Yearbook. The Sporting News 4/27/55, interview with Maureen Baldassini and e-mail from Susan Arnold. New York Times obituary, August 16, 1965. According to an unsourced and undated newspaper article written shortly after Stan’s death, the divorce was granted on July 12, 1965. Interview with Maureen Baldassini. Confirmed with cemetery. Unsourced and undated newspaper article written shortly after Stan’s death provided by Susan Arnold.